Have you ever wondered how a homemade peanut butter is made? Or how home bakers easily ground nuts into cupcakes for the most delightful flavor? Have you attempted several times to cook baked treats with nuts unsuccessfully? If you have every discarded or thrown a baking recipe with nuts away only because you simply didn’t know how to pull it off, it is high time you dig them out of whatever pit you threw them. Nonetheless, it is very hard to ground nuts manually as there is no assurance that you will be able to finely crush the nuts. You can only achieve this with the aid of a kitchen apparatus and it is called food processor for nuts. Of course, you can also use a food processor for baking, thus, you can include the nuts with your dough mixture and blend everything together for the best outcome. In this article, we will be taking a look at the best food processors for nut butter on the market currently. After reading this guide, we are confident you will be able to conclude on the food processor that is most suitable for your needs. Although the market is filled with numerous options, we have helped narrow it down so that you will be able to find your ideal machine easily. If you are looking for a food processor that will easily handle tough tasks like nut butter, kneading hard dough or energy balls, you should consider investing in a model that has 600 watts at least. It is almost certain that food processors that have less than 500 watts will find it hard handling nut butter or creamy hummus. Prior to purchasing a food processor, there are some questions you must ask yourself: “what is the capacity of my available space?” and “how many people will I be cooking for?” It is very vital to ask yourself these questions as food processors come in different sizes and with different capacities. If you only cook for two people, a 1.6 liters capacity should be enough for you. However, if you will be cooking for a whole family, you should definitely buy a bigger model with 2 liters capacity at least. You definitely wouldn’t want to be doing things twice because it is never fun. Most food processors usually come with a single motor speed, which isn’t quite enough if you know your food processor will be handling very tough tasks. Also, you should look for models that come with a “pulse” features, as it is required to crush foods such as herbs or nuts roughly and provide quick, yet powerful impulses. Numerous food processors feature an extensive range of extras like different bowl sizes, different blades or citrus presses even. These attachments require a lot of space, which means that if you have limited space in your kitchen, you might need to buy a smaller machine for a start. Nevertheless, the great models usually come together with the extras and attachments, so you just might need to create some space in the attic or basement. 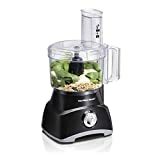 Now you know a little more about what to look for when looking for the best food processor for making nut butter, you can go out and find yourself an excellent food processor without any help. Below are our picks for the best food processors for nut butter on the market. 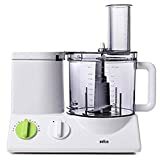 The first product on our list is the Breville BFP800XL Sous Chef Food Processor and is probably the best model reviewed here. While it is the most expensive model on this list, the high cost is justified by the incredibly powerful motor that comes with it. The motor that comes with this food processor has 1600 watts, which is sufficiently solid to slice through even the thickest of foods. Furthermore, this excellent food processor features eight different disc and blades to adequately handle any kind of food processing task you might want to throw at it. This model also comes with special discs, particularly for slicing French fries, whisking, and kneading a dough. This provides you with several options as per the sort of food you can prepare using only this excellent machine. Besides, this mode comes with a storage box to store all the parts. In addition, this food processor gives you many options to choose from as it comes in 3 distinctive colors, which are red, black, and stainless steel. Also, this model is made to be extremely durable as it is made from a die-cast mold. While this doesn’t measure up to some models, it provides you with more options definitely. The discs, blades, and bowls are all easy to clean up. Also, this food processor is extremely user-friendly. It features an easy-to-use pulse button which enables you to have a lot of control over your food preparation. With the incredibly powerful motor on the mode, it can slice, ground and chop foods to forms you never thought they could be reduced to, all in a few seconds. According to users, this model can perfectly grind almonds and slice mushrooms much quicker than so many models on the market. Nevertheless, despite how incredible and useful the powerful motor is, it does come with a drawback. Instead of shredding extremely soft foods such as cheese, the powerful motor mashes them. This shows how powerful the motor on this model is, the kind of power that can’t be matched by most food processors on the market. While it gives you consistency when handling soft foods, you will have to exert a little more control if you want to get the best results. While this food processor is more expensive than most models on the market, there is no going wrong with it. With a powerful motor, excellent and handy accessories, and a bit of practice, you will be too used to this appliance in no time that you wouldn’t be able to prepare anything without it. 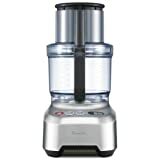 If you are looking for a food processor that will provide you with incredible value for money, the Cuisinart DFP-14BCNY 14-Cup Food Processor is by a long shot the best option on the market. 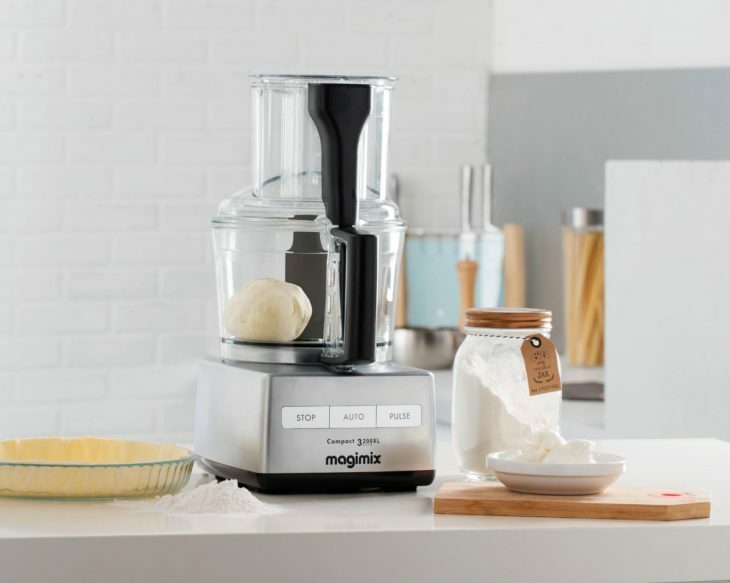 While there are a lot of modes that cost significantly more, none of them can match the general performance of this food processor. Cuisinart is company known for its high-quality products, and his model shows why they are so greatly respected. For its price, performance, and excellent value for money, the DFP-14BCNY eclipses every one of its rivals available today. Behind any excellent food processor, there must be a very powerful motor. This model from Cuisinart features a 720-watt motor which is sufficiently powerful to slice and cut through the thickest and densest of foods. There is absolutely no doubt about the power of this machine as it can easily handle any kind of processing task thrown at it, no matter how tough. While the Breville model we reviewed above features a more powerful motor than this model, you won’t really notice any difference. Both machines are very powerful. Furthermore, this model comes with a very large feed tube. The feed tube is sufficiently large to contain several whole foods such as oranges and apples and longer foods like celery with no troubles. You can breathe a sigh of relief knowing you wouldn’t have to do a lot of prep work cutting the food in order to make it easy for the processor to handle them. This food processor is capable enough to handle large foods easily. Lastly, this food processor comes with a 14-cups bowl which is sufficiently large to handle large sizes of foods simultaneously. With this model, you wouldn’t have to cook the same thing twice as its bowl and feed tube are sufficiently large for any food you want to cook. When it comes to the manufacturing of kitchen appliances, Hamilton Beach is one of the most popular brands. They are known for their manufacturing of top quality kitchen appliances such as slow cookers, food processors, and microwaves. While this machine is one of the cheapest options out there, it still performs admirably. However, this processor is more suited to people who only utilize their food processor one in a while. With a 450 watts-motor, a 12-cup capacity, an S blade and a shredding disc, it is easy to see why this model is very popular. If you want to choose the blade’s speed, there are two-function knobs that are easy to use. The entire thing clicks and snaps into place when necessary and the blade is surprisingly very fast for the price range of this model. While this model doesn’t come with the bells and whistles of more expensive models, it provides good value for money by providing similar functionalities as more expensive units. If you do not require more than a capacity of 12 cups and you will be using it just once in a while, the Hamilton Beach will undoubtedly be a great addition to your kitchen. Like the Hamilton Beach model we just reviewed, the Braun FP3020 also comes with a 12-cup capacity. However, this machine comes with a slightly more powerful motor with 600 watts. Besides, it features 11 different speed settings and 7 blade options for an extensive scope of combinations. Furthermore, almost all the parts of the Braun model can be put in the dishwasher, except the base because of the motor, of course. Also, the machine comes with a large chute that can handle large items without you needing to chop and slice them first. Another excellent thing we like about this model is its quite operations which is due is the efficient motor. If you want more functionality, there are some extra blades you can purchase separately. While the Braun is only suitable for singles and small families, it is a decent machine with excellent performance. It is very easy to use this machine, and it comes with a start-up feature which enables the machine to start from any speed rather than spinning through all the speeds before getting to the one you want. While this Braun model performs excellently, we don’t like the fact that it only comes with a year warranty. A lot of people prefer buying apparatuses with longer guarantees and that could be bad for the sale of this machine. However, this machine is durable and well-constructed and it should definitely serve you for a long period of time. Another downside of this machine is that it seems to be quite messy in its operation, something which a lot of users wouldn’t appreciate. While this machine is a high-end food processor and is understandably expensive, it provides really good value for money. With a very powerful motor with 720 watts and a very large feed tube, this machine quickly purees, shreds, slides, and chops with incredible ease. Besides, it has a 14-cup capacity which makes this machine perfect for large families. Furthermore, this machine features an extra 4.5-cup bowl which is ideal for small batches of nut butter. The control system of the machine is electronic touchpad buttons, and you will also find a different button on the machine which is used for dough mixing. The motor on this machine is also powerful, and the blade and disc are very impressive. In addition, this machine comes with a large chute and every part can be cleaned with the dishwasher. This machine is made of heavy die-cast aluminum instead of stainless steel. This is a fairly suitable machine for people who are looking for quality but aren’t looking for extra unnecessary attachments. Lastly, the motor comes with a 20- year warranty and the entire unit comes with a 3-year warranty. Generally, this processor can surely be expected to last. Also, it is cuter than the other Cuisinart model above. The Hamilton Beach 70740 is the kind of machine that you don’t see every day. It performs excellently and it is also very affordable. With an 8-cup capacity, 450-watt motor, this machine is powerful enough for consistent use. However, you should note that it will take a little longer for this machine to completely smooth-out purees from sturdier or thicker ingredients. Furthermore, this model comes with a pulse function and two-speed control setting. Likely the costlier modes, this machine comes with powerful and quick stainless steel blades that will chop, shred and slice with great ease. The motor, with 45o watts, is also powerful enough to handle thick foods. But while this machine is as powerful as a lot of costlier models, don’t expect it to deliver consistent results to them. But for people who want great performance at an affordable price, there is no going wrong with this machine. Every part of this machine can be washed with dishwasher and it comes with a one-year limited warranty. While we would have preferred the warranty to be longer, this machine is a perfect option for people looking for a processor for quick food preparation. 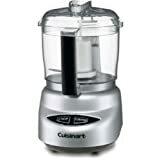 When people talk about kitchen appliances, it is almost certain that they will mention Cuisinart. Cuisinart is almost synonymous with kitchen appliances. This model comes with a 250-watt motor, which is ideal if you want to make a little amount of nut butter. If you are in search of a budget-friendly option that is user-friendly and compact, this machine is your best bet. This mini food processor from Cuisinart performs admirably when handling things like hummus and pesto, and the motor that comes with it is surprisingly powerful for such a little apparatus. It is easy to use, and it features a grind and chop button, of which each button rotates the blades at dissimilar speeds. However, the machine comes with no chute, which means you will have to stop at intervals top open the cover and put more ingredients. While this mini processor is really mini in the eyes, the noise it makes is actually more than even bigger models. Thus, if you are allergic to loud noise or you live where loud noise isn’t tolerated, you might want to look past this food processor. Besides, the casing of the machine is made of flimsy plastic, which isn’t as durable as stainless steel. However, like it is rightly said, you get what you pay for. Having said that, we must mention that the Cuisinart mini prep plus food processor is really a decent simple food processor. But we don’t think it is the right option for you if you are want to be making large quantities of almond butter, or if you cook for a quite large family. If you are fed up of using your hands for things like chopping and slicing vegetables, grinding up nuts and seeds, grating and shredding cheeses, and mixing the dough, or if you regularly make homemade peanut butter, then you should definitely consider purchasing a food processor. With these incredible machines, several hours of cooking time in the kitchen can be saved and the energy could be used for other things. Having listed 7 of the best food processors available on the market in our guide, we are confident you will find the one that is right for your needs. Ensure you remember to look at the necessary features to consider and read the reviews, and we are sure you will buy the best model for your needs.